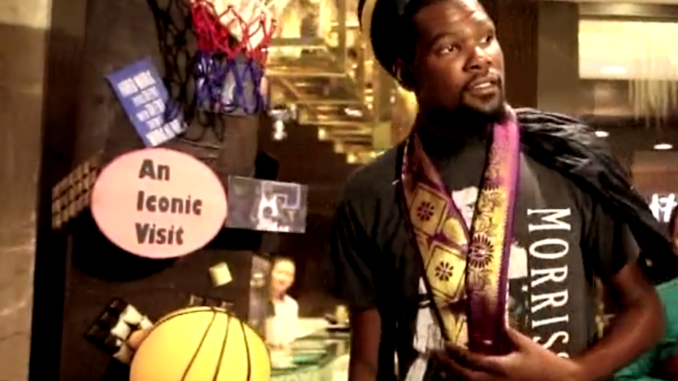 NBA Finals MVP Kevin Durant will work with participants of The NBA Academy in India this summer. Durant, the 2017 Bill Russell NBA Finals Most Valuable Player, will travel to New Delhi on July 27 to donate two new basketball courts to the Ramjas School as part of the Kevin Durant Charity Foundation’s BUILD IT AND THEY WILL BALL Courts Renovation Initiative. Durant will then visit The NBA Academy India in Noida, becoming the first active NBA player to visit the academy. Durant will coach the prospects through a series of shooting, passing, dribbling and defensive drills. Later in the afternoon at the academy, Durant will lead a large-scale basketball clinic for 5,000 youth from the Reliance Foundation Jr. NBA program – 1,000 of the athletes will be onsite while the other 4,000 boys and girls will join virtually from Bengaluru, Chennai, Hyderabad and Kolkata via a satellite link. Durant, a 6’9” forward from the University of Texas, was selected second overall by the Seattle SuperSonics in the 2007 NBA Draft. An eight-time NBA All-Star and the 2014 Kia NBA Most Valuable Player, Durant averaged 25.1 points, 8.3 rebounds, 4.8 assists, 1.6 blocks and 1.1 steals per game during the 2016-17 NBA season while leading the Golden State Warriors to the franchise’s fifth NBA Championship. The NBA Academy India, an elite basketball training center at Jaypee Greens Integrated Sports Complex for the top male and female prospects from throughout India, officially opened in May. The NBA Academy India employs a holistic, 360-degree approach to player development with focuses on education, leadership, character development and life skills. As part of the program, the students compete against top competition throughout the year and have an opportunity to be selected for travel teams that play in international tournaments and exhibition games. The NBA Academy India builds on the NBA’s existing basketball and youth development initiatives in India. The Reliance Foundation Jr. NBA program has reached more than 6 million youth and trained more than 5,000 physical education instructors nationwide since its launch in 2013. On April 7, the NBA launched NBA Basketball School, a network of tuition-based basketball development programs around the world open to international male and female players ages 6-18. The first NBA Basketball School launched in Mumbai, India as part of a multiyear agreement with India On Track (IOT), one of India’s leading sports management, marketing and development companies. The second NBA Basketball School launched in New Delhi on June 30.